During the development stage of their BVK series of rods, Temple Fork Outfitters realized there was a need for a series of reels to compliment their standards in terms of performance, weight, quality, and affordability. 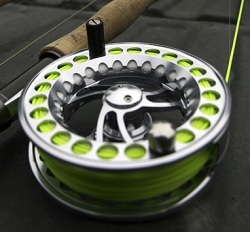 The result is the introduction of their new series of BVK super large-arbor reels. BVK reels are precision-machined from bar stock aluminum. The clear silver anodized frames and spools are ported to eliminate excess weight. Equally at home in both fresh and saltwater, the super-large-arbor design provides faster line pick up and helps the maintenance-free drag system work at a more constant pressure than standard arbor reels. Delrin and stainless stacked discs make the drag silky smooth and the one way clutch bearing makes engagement instant. Left to right hand conversion takes only seconds. Their are three models available. The BVK SLA I has a spool diameter of 3.3-inches, weighs 4.6-ounces, and matches well with a WF4F fly line and 75-yards of backing. MSRP: $230, spare spools will retail for $130. The BVK SLA II has a spool diameter of 3.75-inches, weighs 4.9-ounces, and matches well with a WF6F fly line and 200 yards of backing. MSRP: $240, and $150 for a spare spool. The BVK SLA III has a spool diameter of 4.1-inches, weighs 5.2-ounces, and matches well with a WF8F fly line and 205 yards of backing. MSRP: $250, and $160 for spare spools. For more information on the BVK reels or any other of Temple Fork’s product line, visit your local TFO dealer or visit the TFO Web site. More TFO mentions on MidCurrent.